The day we closed on our house, we had some time to kill before we had to be anywhere, so to celebrate we went to buy our supplies for our concrete countertops, even though we knew it would probably be a couple weeks before we had time to tackle that project, but it wasn’t until after Christmas that we actually did them! This was our most daunting, nerve-wracking project to date before we started, and now that it’s over, I’ll tell you, it is by far my least favorite project EVER. However, I LOVE the results. The counters look amazing…they’re the perfect balance of the lovely rustic imperfection that I adore, mixed with the industrial texture, color and durability that drew my eye to concrete countertops in the first place. I first saw this idea on Pinterest (where else, right?!) and so I researched and found several blogs with tutorials and/or reviews with their own experience. After considering our options, we decided on Ardex Feather Finish Concrete and Ardex Concrete Guard. 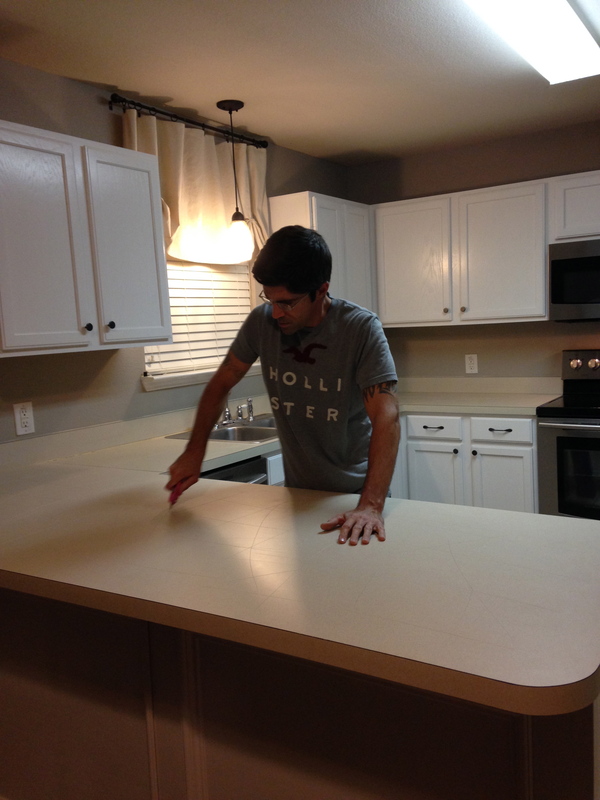 And as crazy as it sounds, we decided to do an overlay method over our builder-grade formica. I admit, I was skeptical. Overlay? Aren’t we supposed to build forms and pour the concrete? Yikes, I hope this really is okay. As with any chemical product, please read the packaging labels completely and the MSDS. I wish I had done this before buying the Ardex Feather Finish and Concrete Guard. This stuff is no joke. I was taken aback when I realized this, because out of all the DIY Ardex countertop tutorials I’d read, not one blogger mentioned this! Now, I would never hold another person accountable for my negligence to read the hazards of any product, but please, for your own safety, do your homework, no matter what project you’re working on! Find out if you need chemical respirators, dust respirators, gloves, eye protection, etc. FYI-you need ALL of the above with these products, which doubled the cost, although it was still very inexpensive for a countertop makeover. Also, plan on this taking just short of a week if you’re solely working on it in the evenings like we did. If you have children and pets, arrange for them to not be home, even in another room or a different floor for the sealing step. And when you seal it, plan to be out of your house for 2 full days. 1. Read all labels and MSDS. 2. Buy the correct chemical respirators, dust respirators, gloves, eye protection. This will end up doubling the cost of your counters, but it’s absolutely necessary. 3. Plan on this taking just shy of a week if you’re working on it during the evening hours like we did. 4. Arrange for your children and pets to be elsewhere while sealing and do not spend the next 48 hours in your house afterwards. So have I scared you out of doing this project yet? I hope not! I just want to let you know what you’re getting into so you and your family stay safe and healthy. Let’s get started if you’re sticking with me after all that! A. 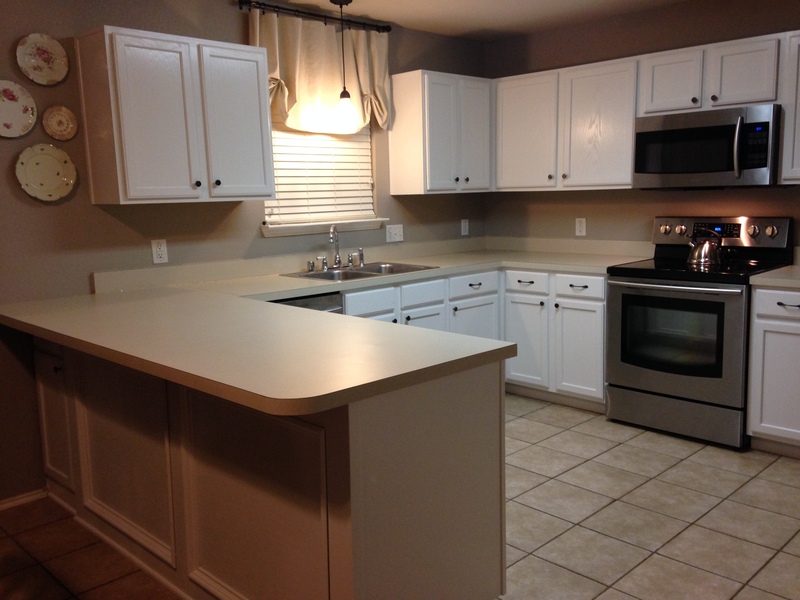 Begin with a clean countertop. B. Score counters with your wallpaper scorer and/or your box cutter. This required my hubby’s muscles. And this is also the part where you may have a minor heart attack because there’s no turning back now! You just tore up your counters! C. Vacuum and wipe any dust from counters. 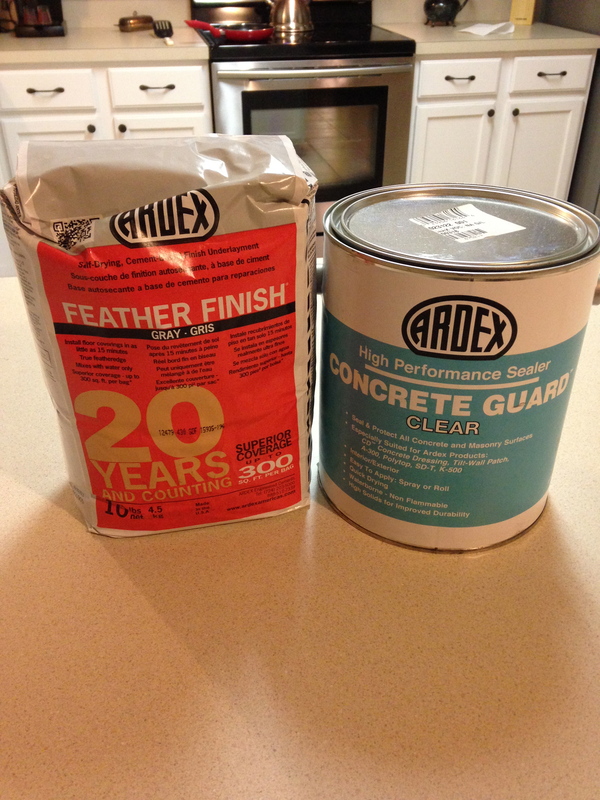 D. Mix up a small batch of your Ardex Feather Finish with water. Whisk well until smooth. 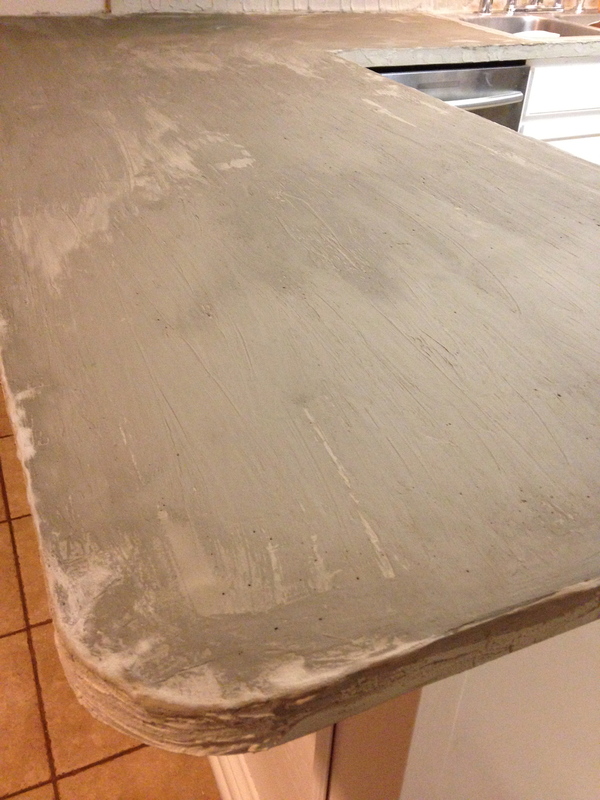 Play around with this ratio…we ended up preferring a thicker batch of concrete as opposed to a thinner batch. see that little “butler’s pantry’ over there? that was our inconspicuous starting point…practice point, whatever you want to call it! E. Beginning in a small, inconspicuous area for practice sake, begin by pouring some of your concrete onto a surface. Using your trowel, spread the wet concrete like peanut butter on a piece of bread. Or like frosting on a cake, jelly on a biscuit. 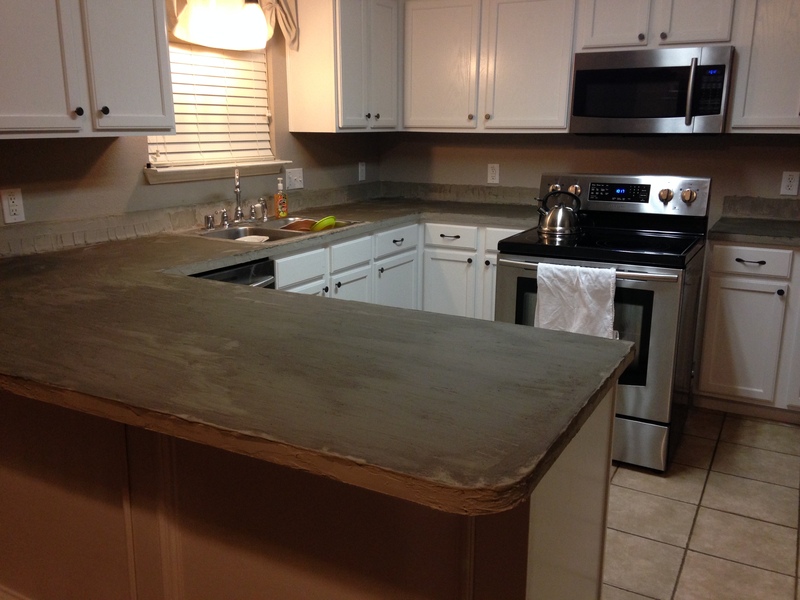 Because this won’t be your only coat of concrete, don’t worry if some of your old countertops show through in some places; you’ll be doing another layer or two. That said, don’t go too light; you want your counters covered well. F. Allow this first coat to dry. We let ours dry several days (huge headache, I know!) because I wanted to be safe. G. Repeat step E, taking care to cover well, but not too thickly. Smooth your concrete as well as you can. 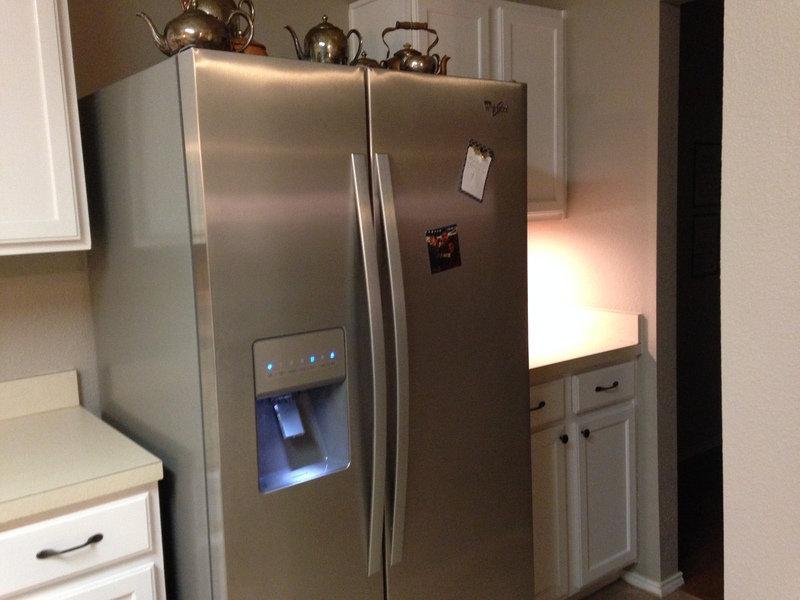 This was difficult for us and I did not get the counters as smooth as I expected. Luckily, the urbanesque, rustic, semi-undone look is something we like, but it was a little more frustrating at first. I finally had to treat it like a piece of artwork and call it good when I felt I had done all I could. H. Allow second coat to dry. Again, we let this dry several days. I had NO CLUE my kitchen would be out of commission for SO long, did I mention that??? If you feel the need, add another layer of concrete or two. We left it at 2 coats because we had applied the concrete fairly thick and felt confident that it would be durable enough. I. When the counters were fully dry, it was then time to sand them. Y’all. I can’t even tell you how much I hated this project at this point. But don’t be discouraged, most of it was because I had no idea it would take us so darn long to complete. I would have psyched myself up, had I known. 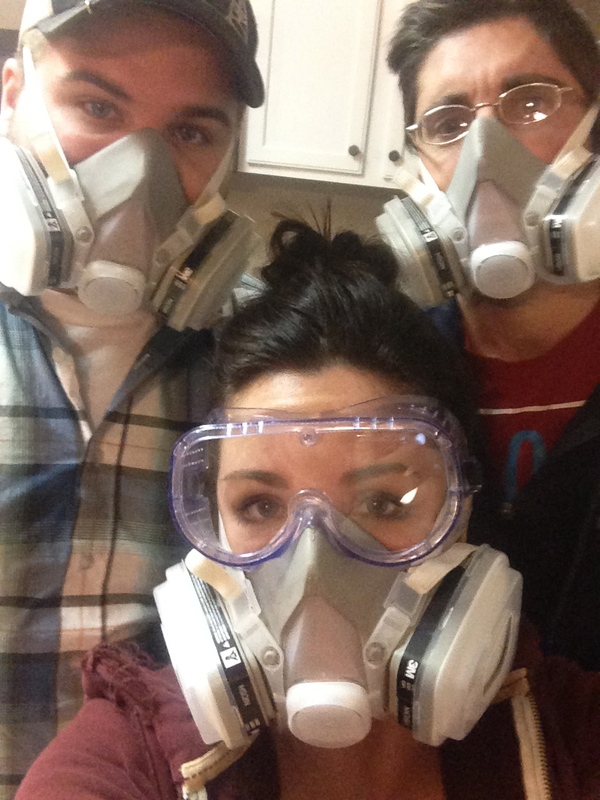 So my brother, hubby and I sanded for several hours WITH our dust respirators on. 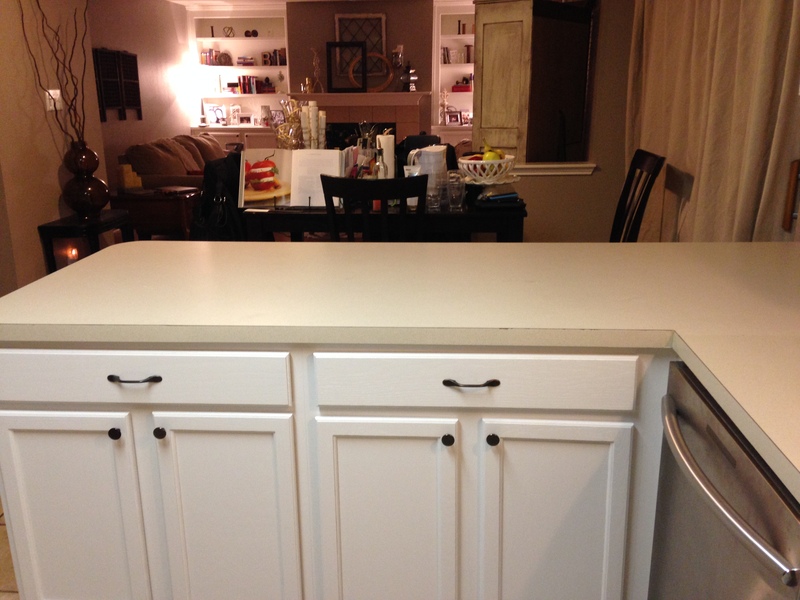 Be careful for the edges; you don’t want to sand down to the old counters. I really expected to be able to sand these down perfectly, but that was not reality. They are super smooth to touch, no rough edges or big divets, but they have a lot of texture for sure. J. Vacuum all dust and wipe counters thoroughly with a tack cloth. This is the best time to clean all the dust up. It was everywhere, including on top of the cabinets and fridge. I didn’t want to stop and clean dust at this point, but it just made sense. K. Now you’re ready to seal these babies! FINALLY!!! You’re almost there. Open your windows, make sure your pets and children are nowhere in the house and turning on some shop fans is a good idea to keep the air circulating, only if you’ve cleaned all the dust up by now. 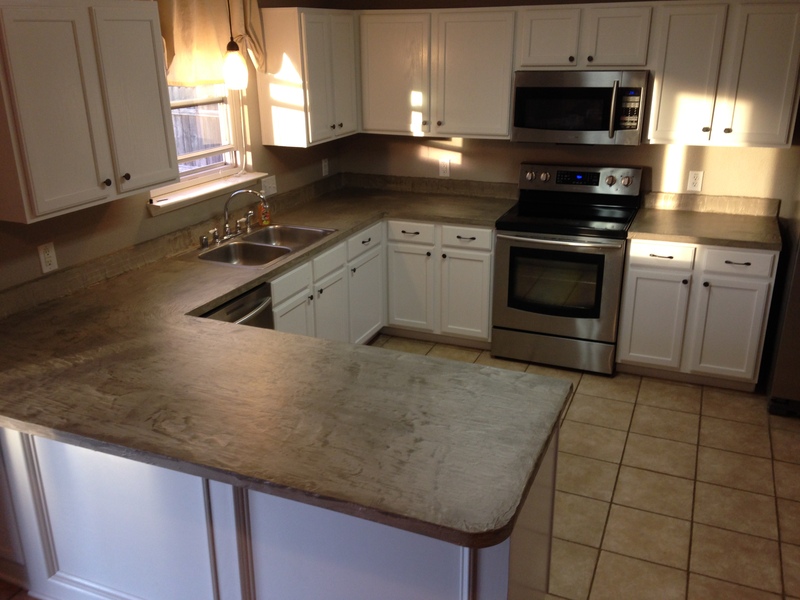 Wearing a chemical respirator, you can either roll or paint the Concrete Guard onto your new countertops. I rolled the large surfaces while my hubby and brother used brushes for edging and such. I don’t think I preferred one over the other, except that rolling was obviously faster. L. As soon as this was finished, we grabbed our overnight stuff and left. There is no way we could have stayed in that house all night without adverse health issues. Even the next day when I went back to check and see how it was, the smell was just way too strong so my son and I busied ourselves away from home the entire day. You may want to do another layer of Concrete Guard, however we didn’t and after 6 weeks, the counters are holding up very well and looking exactly the same. We plan to do a second coat, but we haven’t been able to choose a time when we could be away from home for a couple days. We went ahead and threw away all of our clothes, cloths, paintbrushes, etc. that we used during this project because they were past the point of being able to be washed out completely. We were very careful with our counters for a couple of weeks just in case they needed the extra time to “cure”. Not sure if this was necessary, but seriously. With all that work I was NOT about to mess them up. So…let me know how your counters turn out! Tags: Ardex, Ardex concrete counters, ardex counters, budget counters, budget countertops, cheap counters, cheap countertops, concrete counters, concrete countertops, DIY concrete counters, how to makeover your countertops inexpensively, how to makeover your kitchen. Bookmark the permalink.